Manhattan women have a lot of options when it comes to their plastic surgeon. Getting to know doctors through interviews, like this recent interview with Dr. David Rapaport, are a great way to get a feel for their personality and practice. 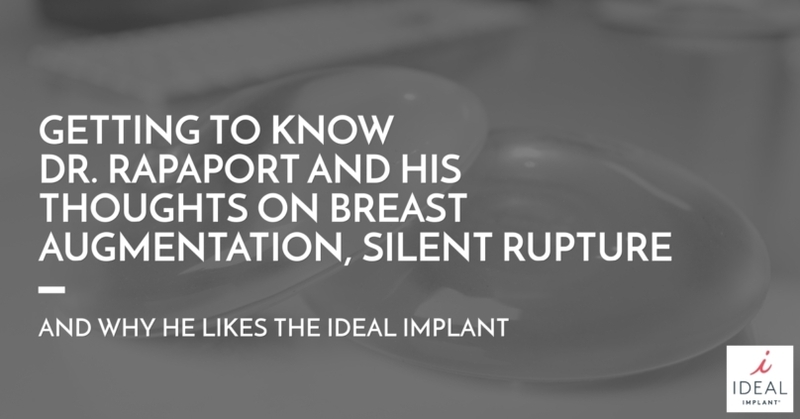 Read more to get to know Dr. Rapaport and his thoughts on the new IDEAL IMPLANT® Structured Breast Implants. Why do you think women choose your practice over other options? What is the process like for a woman coming in for her first breast augmentation consultation? “When a woman is having a breast augmentation for the first time, it’s very important for her to understand what her choices are in terms of implants. I was training in plastic surgery in 1990 when the FDA said not to use silicone gel implants for anything other than breast reconstruction. That remained true until 2006. Because of that, I learned very quickly in the 90’s how to use saline implants. Soon after I finished training, endoscopic plastic surgery hit the scene. I was one of the developers of endoscopic breast augmentation, which means putting implants in through the underarm. The saline implant is a very attractive implant because it can be rolled into a small cigar shape and put in through a very small scar. It is a wonderful implant when hiding behind the right breast. The issue with saline implants is that in some patients there were issues with rippling which could be visible. They also didn’t feel that natural. The other problem with it was a relatively high rupture rate. How did you hear about the IDEAL IMPLANT ? What’s been your overall impression of the IDEAL IMPLANT ? Do you feel like IDEAL IMPLANT compares nicely with other options you’ve used? “I love being a doctor, I love being a surgeon. It all started with my residency at Harvard in general surgery. My mentor there taught me to listen to my patients. You need to understand that there is no all-purpose algorithm for treatment. Treatments need to be customized based on the concerns and values of the patients. I find that too many doctors these days do everything on a reflex action. That’s overly simplistic and it’s simply wrong. Patients need a variety of options. Considering breast implants in Manhattan? Contact Dr. Rapaport today to discuss your options. Simply call 212-249-9955 or visit www.parkavenueplasticsurgeon.com. Dr. Rapaport’s office is located at 905 5th Avenue (@72nd Street) New York, NY 10021. Call today for more information on IDEAL IMPLANT® Structured Breast Implants.